A Coole Electrical Electrical carry out commercial electrical installations in Yorkshire and beyond. Our knowledge and expertise in high spec technologies and specialist lighting and heating make us the first choice for local contractors. We work closely with the client from start to finish to provide a finished project that meets the clients requirements on time, in budget and snag free. From new builds to refurbishment the A Coole team can accomodate our clients needs without compromise on price, quality or workmanship. Our NICEIC accreditation guarantees you the best service possible, ensuring our clients leave us 100% satisifed. For a more in-detail chat about what we can do to improve your commercial property and keep you safe and legal call one of our dedicated team or email us and we will get back to you within 24 hours. Many small business’ fail to carry out electrical maintenance which can result in health and safety hazards and fines. A Coole Electrical offer the following services to help keep your business open and safe. 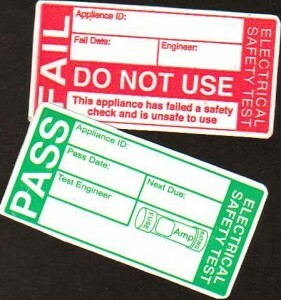 PAT Testing (recommended once every 12 months). Periodic Testing (every five years or when a change of tenancy occurs, whichever is sooner). Re-lamping of internal and external lighting. All of the above can be offered on a scheduled maintenance plan backed up with a responsive service or just the latter, whichever suits you best. 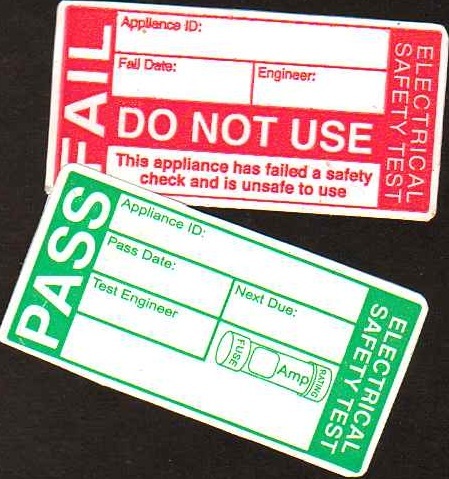 Health and safety regulations require that the electrical appliances be safe to prevent harm to the workers. Many types of equipment require testing at regular intervals to ensure continual safety; the interval between tests depending on both the type of appliance and the environment it is used in. 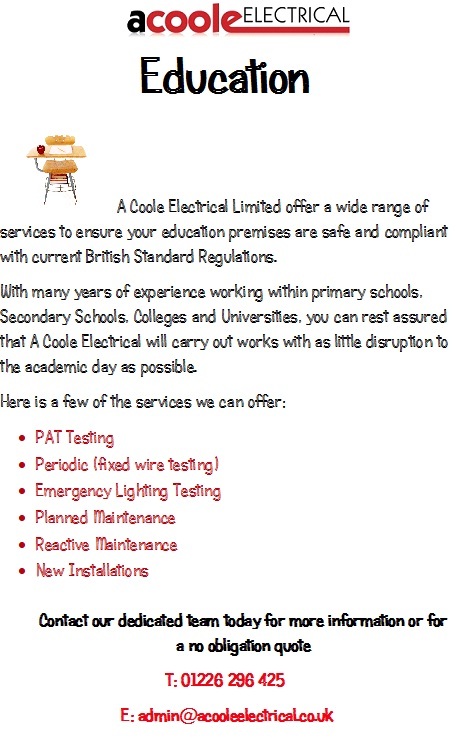 What PAT Testing service can A Coole Electrical offer? A Coole Electrical offer a wide range of services when it comes to PAT Testing, from one off tests to yearly scheduled tests, from 10 items to 10,000, A Coole Electrical is the ideal choice for a fast, efficient service backed up by the guarantee of an NICEIC accreditation. For more information or to book in your PAT Testing simply call our offices on 01226 296 425 and speak to one of our dedicated team. Each memeber of our staff are able to advise on PAT Testing and and the services we offer, don’t worry if you are in need of urgent PAT Testing, we are able to ‘on many occasions offer a re-active service on PAT Testing of all types’. We operate in a vast area covering Leeds, Huddersfield, Wakefield, Barnsley, Sheffield, Rotherham and Doncaster. A Coole Electrical offer many services to help reduce your carbon footprint, from new lighting schemes to simply changing the type of lamp you use, we aim to get the lux levels you require, with fittings that look good and will save you money! For information on government recommended lux levels, visit HERE and go to page 3. How do energy-saving light bulbs save me money? Traditional incandescent bulbs only use a small proportion of the electricity they draw to generate light – the rest is wasted as heat. Energy-saving light bulbs, however, use most of the electrical energy they draw to generate light, and very little is wasted as heat. Therefore switching to energy-saving light bulbs will save you energy and money, and reduce the amount of carbon dioxide emitted to the atmosphere. Carbon dioxide is one of the main greenhouse gases thought to be responsible for global warming, so by switching to energy-saving light bulbs you’ll be helping to reduce climate change. With companies reporting a saving of over 35% in there lighting bills over 5 years, why not call today and grab some of these savings for yourself! Call the obvious choice for customer service and professionalism backed up with an NICEIC Accreditation! 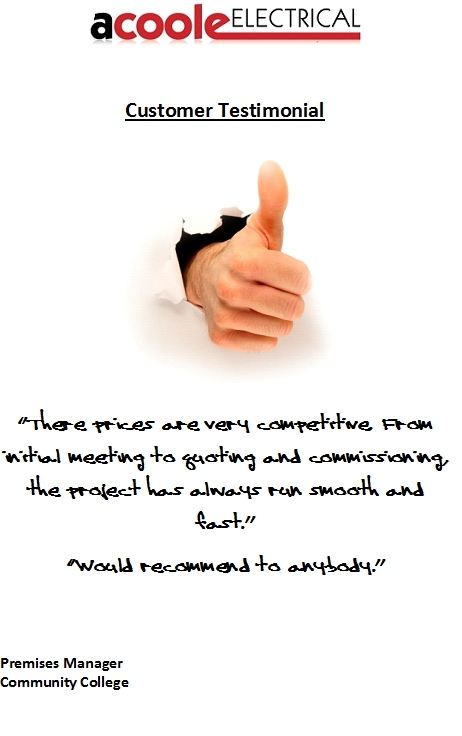 Do you know the benefits of using an NICEIC Approved Contractor? A Coole Electrical Limited are one of the few NICEIC registered electricians in Barnsley, for more information on what services an NICEIC Approved Electrician can offer please click HERE. Our team are fully qualified to undertake a full range of domestic installations, all covered by a NICEIC Insurance backed warranty and on completion we will supply the relevant NICEIC test certificate. From 1st January 2005 all electrical work in dwellings in England and Wales need to comply with Part P requirements and must be carried out by persons who are competent to do the work. A Coole Electrical Limited are fully qualified to do this – we are the professionals you can trust. Our work is assessed annually by NICIEC to confirm that our work continues to meet the highest standards. The Domestic Installation Certificate is intended only for a single dwelling (house or individual flat). It confirms that the electrical installation work, to which it relates, has been carried out in accordance with British Standard BS 7671. Over time all electrical installations will deteriorate. Legislation requires that all electrical installations are maintained in a safe condition and therefore must be periodically inspected and tested to ensure compliance with BS 7671. Under the Health and Safety at Work Act 1974 which incorporates The Management of Health and Safety at Work regulations 1999, a statutory legal duty is placed on all Employers to ensure that employees and all others are not subjected to risks to their health and safety. In particular, The Electricity at Work Regulations 1989 requires those in control of part or all of an electrical system to ensure that the system is safe to use and it is maintained in a safe condition. As well as installing new or upgrading existing installations our experienced team can undertake electrical inspections, testing & certification. Our team are fully qualified to undertake a full range of domestic installations, all covered by an NICEIC Insurance backed warranty and on completion we will supply the relevant NICEIC test certificate. It is now a criminal offence if letting agents and landlords do not comply with Part P building regulations. This means that any unqualified electrician must submit plans to a building control body before commencing work. This includes repairs, replacement, extra power or lighting points any any alterations to specialist locations such as bathrooms, kitchens and outdoors. Barnsley Electrician – Yorkshire & Humberside – Where else can you find us? A Coole Electrical can provide a house rewire and rewiring services to properties throughout Yorkshire & Humberside, and other areas across the North of England. If it is a property that you need rewiring whether it’s a house, office, or a commercial property then A Coole Electrical are the company for your rewire. We offer affordable prices and a service that is second to none. Don’t just take our word for it, visit our Facebook page and see what our customers think of us for yourself. A house rewire would be required if the electrical wiring in your house is old or inadequate; otherwise over time this could cause an urgent safety matter. The first sign to check is the colour of the cables – if you find black coloured / black sheathed cables entering the consumer unit then this is an immediate sign that the wiring needs checking professionally. Modern electrical cables are either grey or white and are insulated by a coating of PVC – the old black cables were insulated with rubber which perishes and decays with age. These black rubber coated wires could be up to 40 years old, over the time the deterioration allows the conductors inside the cable to meet. This can manifest itself as a blown fuse, but if you replace the fuse it will simply blow again. The only solution is to replace the wiring, contact us for a free electrical survey or read on for other signs to watch out for. Other items to look out for include metal conduits running to the sockets or lights, aluminium cable (in use primarily from the 1950s to the 1970s), lead sheathed cables (common in the 1930s) for socket circuits, sockets on skirting boards,and an old fuse board. It’s not just about being on the safe side.. Are you looking to sell or rent soon? Modern houses place a much higher demand on the electrical system than in years past, so if you have antiquate wiring it is an accident waiting to happen. Even if the safety issues aren’t enough to convince you, you will have to get your electrics updated before you sell your house or rent it out, a basic electrical periodic inspection report will reveal any inadequate or defective electrical systems and prove if a building or home is electrically safe. No mortgage lender will lend money on a house that could be a potential fire hazard. If you have concerns about the electrical systems in your property then contact A Coole Electrical using our simple contact form or by telephoning us directly on 01226 296 425. Just let us know the type of work required.